Pondliner.com PVC Fish Pond Liners are made from durable 30 mil fish grade PVC. You can choose either blue pond liner or black. Pondliner.com PVC Fish Pond Liners contain UV stabilizers that help protect the liner from breaking down from sunlight. However, even with this protection, PVC Fish Pond Liners usually fail within 2-3 years when left exposed to direct sunlight. 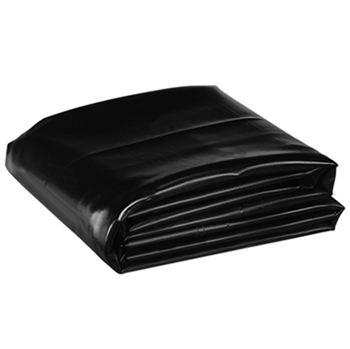 You can greatly extend the life of your PVC black or blue pond liner by covering the liner above water level. All PVC pond liner options are custom sized. One dimension (either the length or the width) must be divisible by 6 feet. Please allow an extra 7 days for your PVC liner to be seamed.